Set includes: 8.4 quart pressure cooker; 10.2” pressure skillet; glass lid; perforated inset; tripod 8.5 quart capacity. Lifetime Warranty: made with high quality stainless steel; with normal use and care, this product is guaranteed for a lifetime. Safety Mechanisms: Ul-listed, meeting the industry standard for safety. Versatile: works on all cooking surfaces including induction cook tops. Proven Company: Fissler has produced high quality cookware for more than 170 years. The Fissler Vitaquick Quattro Set meets all your family’s cooking needs. It includes a pressure cooker and a pressure skillet. ​The 8.5 quart pressure cooker is the perfect size for a family of 4-6. The pressure cooker has many features. It cooks silently and is steam-free, so that it uses less water and energy. It is UL-listed to meet the industry standards for safety. The patented features include pressure release valves and large indicator rods. ​The cooker has two settings so that pressure can be adjusted to the foods being prepared. The lid locks securely with one hand and visually indicates when the lid is closed. Only when the lid is locked will the cooker build up pressure. ​A measuring scale inside the cooking pot allows you to add ingredients directly to the cooker. The auto-lock handle can be removed for cleaning and the entire cooking pot is dishwasher-safe. ​The large, 10.2” pressure skillet has a glass lid. The skillet features a patented Norvogrill bottom. This honeycomb texture on the frying surface allows you to use less oil for searing, grilling and frying. ​Both the pressure cooker and skillet are made of heavy duty stainless steel that has been polished to an attractive sheen. Both appliances can be used on all cooking surfaces, including convection cooktops. Both appliances have an aluminum core base encapsulated by stainless steel to ensure even heat. ​A Steamer basket and tripod stand are also included, perfect for cooking broccoli, artichokes, asparagus, corn, cabbage fish, mussels, and shrimp. ​Fissler is a German company that prides itself on quality craftsmanship and innovation. The Fissler website has abundant information including videos, product manuals and recipes. Some of the recipes for this product include Stuffed Peppers, Marinated Beef Rhineland Style, and Spicy Carrot Soup. When my daughter announced her engagement, I knew that I wanted to give her pots and pans for a wedding shower present. That is a traditional gift in my family. My mother had been given us a cooking when we got married and I wanted to do the same. However, when I went to look at the cooking sets, I was dismayed. There were many bright colors with lots of pots and pans in a variety of sizes, but many had Teflon, non-stick surfaces. I knew these cooking surfaces had many health concerns. I also had experienced non-stick surfaces that had scratched and blistered. These sets were certainly not what I wanted. ​I started to do some research. My daughter is health conscious. I wanted to find a way of cooking that accommodated her busy life style, but also allowed her to eat the kind of food that she enjoys. I read an article that praised pressure cooked food. It gave many reasons. It stated that pressure cooked food was more nutritious. Less cook time meant vitamins and minerals were retained. It said the food was tastier because it was not diluted by large amounts of liquid as happens in many conventional cooking processes. Pressure cooking also saved energy by cooking food faster the article claimed. Another advantage was that cooking with a pressure saves time because no defrosting was necessary. I discovered there were many recipes for one-pot meals, so clean-up was easy. ​Pressure cooking sounded good to me. That is when I started looking. Who knew there were so many choices? And so many deals? 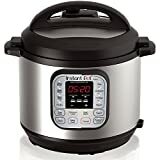 I looked at electric pressure cookers that had multiple functions. I saw pressure cookers with no-stick interiors. ​Then I saw the Fisser Vitaquick Pressure Cooker. The shiny, stainless steel was very flashy, but the appliance was heavy duty. The set was recommended in many magazines. I thought this would be a lasting addition to my daughter’s kitchen. I liked the 8.5 quart capacity. This would give her the chance to cook a meal and still have leftovers. It was perfect, except, I wanted to give my daughter more than just one appliance. The Quatro Set was perfect. It had two sizes of pans, two lids, and a steamer. ​My daughter loved it. She doesn’t have a lot of cooking experience, but it didn’t take her long to master the Vitaquick Quatro. The first dinner she prepared for my husband and I, she used both the pressure cooker and the pressure skillet to make pulled pork shoulder with potato salad. It was delicious. I was so pleased that I gave her a present that she enjoys and values. ​Now, I am planning to get a Fissler Vitaquick Quattro Large Set for my husband and I. Our 40th anniversary is coming up. It is about time for us to try a healthier way of cooking. And the set really does look like a celebration. Fissler Vitaquick Quattro Set is expensive, but well worth the money. It is a quality appliance that is built to last. The stainless steel cooking pressure cooker and pressure skillet are attractive, functional and guaranteed for a life-time. There are many reasons that make the Vitaquick superior for cooking: the heating plate allows for even heating; the pressure cooker has an easy to read pressure indicator; the cooker attains pressure quickly and maintains it; the smart design of the squat, wide pot makes it easier to brown foods and safer to reach into the pot. The many safety considerations of the designed earned it the UL seal of approval. The quality of the Fissler Quattro Set is evident.